Stunning location for a photo shoot. I was delighted to be asked to do this shoot by the manager of the hotel in the Granja Porcon who wanted some shots of the hotel surroundings. 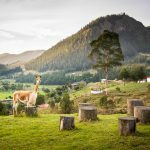 Granja Porcon is a tourism and agricultural collective in the Gran Porcon region of Cajamarca in Peru’s northern highlands. At about 3000m above sea level, it can get cold and rainy but the sun also shines and the sky is so blue, it can look like you have a polarising filter on when you haven’t. The hills and valleys in the region are covered in pines and are somewhat reminiscent of Switzerland or even parts of Ireland (depending on whether the sun is shining or the clouds and rain have come down!) 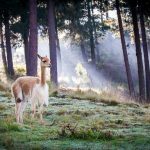 However when you open your door in the morning and find vicunas and llamas happily grazing only yards from your door in the morning mist, there’s no doubting where you are. 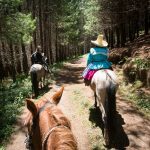 Miles and miles of trails (including Inca trail) are easiest covered at this altitude on horseback and horses are available for hire. 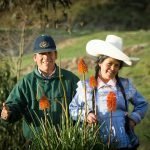 The inhabitants of the Gran Porcon valley all belong to an Evangelical church and form a cooperative that operates farms, hostels/hotels, and tourism activities. 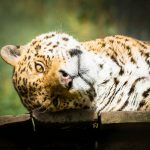 The most unusual feature has to be the private zoo and, while photographing wild animals in a zoo is not something I feel easy about, it is a great place to see some native Peruvian animals up close (including jaguar, puma, condor, guacamayo, andean fox). 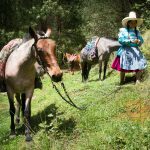 Have a look at the shots from Gran Porcon region of Cajamarca in Northern Peru.